I finished the frame bag project tonight and the result is quite satisfying. The material came from Shelby in one day, but the actual planning and sewing took some time. And the commercial alternative is of course Epic Designs. This does strictly speaking not belong here, but since the participants were the usual suspects from MTB-Turku and since the snow does not currently allow riding a bike on the Kuhankuono trails, it will have to do. At 15:15 we left Rantapiha on skis. There were seven of us. We crossed Savojärvi, skied via the Kuhankuono border stone over the bogs to the Vajosuo lean-to. This took about three hours of fairly efficient skiing for 15 km, mostly making fresh trail. The sunset was quite beatiful and the bog was an extraordinary experience in the light from the half moon. At the lean-to we ate, drank beer and anti-freezing agent and made glorious plans for future excursions. We went to sleep maybe, around 01:00, some in the lean-to and others just on the snow. 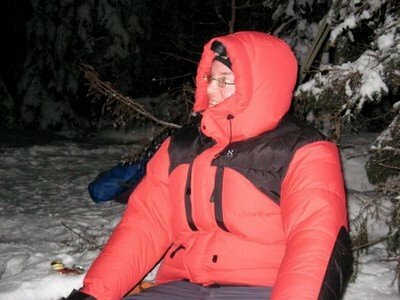 I slept on the snow and was warm and cozy, despite a temperature of about -19°C. A good place to sleep? I woke at some time after 06:00 and got up half an hour later. The fire was already burning. The morning rituals took their time and we left for the return trip at 08:30. The return trip was shorter, about 10 km, and took only a little under 2 hours. The full picture set is here. Today was the first real test ride for the Fargo. Some three hours of riding, mostly hard and soft snow trails as well as some bicycle lanes with six others. Since the photos of yesterday, I've raised the handlebar slightly as well as angled it a little differently and moved the saddle a bit forwards. The riding position feels great and works well at least on the winter forest trails, which do not offer any real technical challenge. The trails where generally in surprisingly soft shape. Has the cold weather and amount of snow kept people inside? No pictures are available. While I did bring the camera today, the memory card was at home in the computer. As a side note, I just ordered material for making a large frame bag from Shelby. I assembled the Fargo today and am mostly done. I got the last missing pieces from Foxcomp yesterday. Some adjustments still remain to be made, but I did manage to test ride it today. I'm sure that I will still make some small adjustments to the riding position, but it was fun to ride as it was. It looked huge in the cramped space where I assembled it, but outside felt (and looked) right. The standover is no problem whatsoever. It actually felt very nimble to ride and the steering was very much like that of the Gary Fisher G2 geometry, which I happen to like. I obviously do not need the bash ring, but it was attached to a crank set that was currently unused. The chainring bolts were stuck, so I will have to drill them away at some point to get a 44t outer ring. The Deore rear derailleur anno 2002 will be replaced with something newer at some point and contemplating getting a short travel Thudbuster seatpost instead of the long travel one I currently have, since I feel that it could have less offset. The large front triangle of the frame does scream for an Epic Designs style frame bag. I will probably try to make one myself. Tahko MTB 120 under 9 hours, since I wasn't able to participate in 2009. Kangasala 24H solo, this time a more serious effort. Participate in the local MTB races. One longer race on the road, either Pirkka 215 km or Mylly 240 km. A longer version of last year's Kuhankuono - La grande finale ride. A 2-3 day trip with the Fargo to the from Turku to the Hanko Peninsula, at the same time checking out the Teijo area, using trails and dirt roads when possible. A pure mtb ride to the Hanko peninsula. Turku-by-night, a mtb ride in Turku, Kaarina and Raisio through a summer night. Generally some more bikepacking, a goal would be one S24O per month. A group of three went out to ride for 2,5 hours in the snow. The most used trails were already in good condition, but there were lots of places where the trail was just soft enough to make it very hard to ride with an ordinary bike with the fairly narrow Extreme 29x2.1 tires. Greenman's Pugsley on the other hand seemed to work really well in these conditions. The trails are still mostly covered with fresh snow, but some of the most used trails were rideable today. I went for a 1.5 h ride, which considering the temperature -14°C and limited amount of usable forest trail was enough.